On September 25th, 2016, Appalachian State's Child Advocacy Club participated in helping WNAC? HC by holding their own diaper drive at Ingles in Boone! 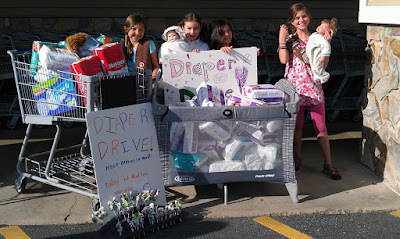 They raised over $200 and 1000+ in diaper donations. This contribution can help over 30 families achieve healthy living for their little ones. Austin, President of the Child Advocacy Club, with the sign they made for the event and the diapers they donated to Who Needs a Change? of the HC. Sunday, September 25, 2016 Who Needs A Change? held a bowling tournament to help raise funds for more diapers in our bank and kick off Diaper Awareness Week! With the help of local businesses such as Vidalia Restaurant and Appalachian Sportswear of Boone, NC, we were able to raise $650 total! Also a huge thank you to High Country Lanes and Meat Camp Church for their donations to our diaper bank fundraiser as well! What a wonderful gift these parents have given their children by encouraging them to get involved in the community and help those who are less fortunate. The value of doing charitable acts for others is rewarding and children feel a sense of pride when they realize they are making someone else's life better. These beautiful girls requested diapers instead of toys for their birthday party and collected 1,024 diapers!! !Thank you girls!! There are many happy, healthy and dry babies in your community because of you. A huge thank you to Libba Moore (ASU Student) for collecting 2,310 diapers from friends and supporters for her 22 birthday! Libba's generosity will directly benefit children in the community. September 10th through the 17th is Diaper Awareness Week. It takes between 8 to 12 diapers a day to keep a baby clean, healthy and happy.That can add up to a lot of money - more than $150 a month. WIC and food stamps do not cover diaper purchases. Please help babies in your community by dropping off diapers to the local diaper bank "Who Needs a Change? of the High Country" located at The Watauga County Children's Council. You may also bring your donations to The Children's Playhouse 400 Tracy Circle Boone. We accept all sizes and can accept open packages. Diaper Drive September 15th, 22nd, 29th!!!! FaithBridge morning worship is at 11:00am at their brand new auditorium at 196 Aho Rd in Blowing Rock (directions). You can join them for service on Sunday morning and bring diapers or drop off diapers Monday-Thursday 9-4 at the Church office. Feb 14th - March 7th, AppstateHACDA will be partnering with Who Needs a Change? of the High Country and ACES to collect diapers for children in poverty who's families can't afford to buy them. Collection boxes have been placed in all dorms, including the APH, as well as the College of Ed. Hopefully, within the next few days, we will have more placed throughout Boone. Show your support and bring us some diapers!!! Wee-Cycle Children's Consignment Sale 687 George Wilson Rd Boone NC Saturday November 3rd 2012! Thank you FaithBridge Church in Blowing Rock for a successful diaper drive! Thank for your support and for collecting 591 diapers at Mary's School! Thank you to Boone UMC for a huge success with collecting diapers for Who Needs a Change? of the High Country! Thanks to Grace Luthern Church for diaper donations! 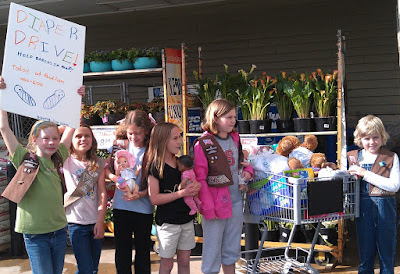 Thank you Blowing Rock Daisy Girl Scout Troop 10396 for your money donation and diaper donations! Huge Success! Thank you Brownie Girl Scout Troop 10396! They collected 982 diapers and $307.79!!! April 20th from 4-6. Blowing Rock Food Lion. Hosted by Girl Scout Troop 10396. We had our first donation from Girl Scout Troop 10396 . They donated 10% of their profit from selling Girl Scout Cookies to Who Needs a Change! Thank you for your support! As of April 21 2012, we have collected 1288 diapers from diaper donations and diaper drives and we have collected $648. 37 !!!! !